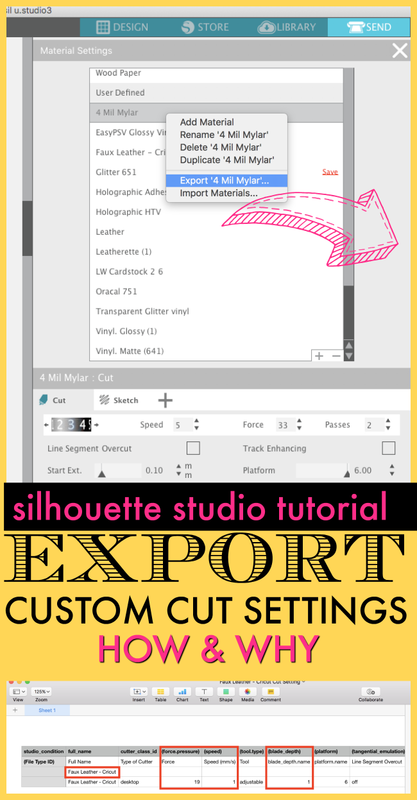 If you're like me and you have added a bunch of custom cut settings to Silhouette Studio then you should take the extra step of exporting - as a back up. Exporting your custom material cut settings takes just a few quick steps. Obviously you only need to do this if you've added custom cut settings to your material lists in the Send panel of Silhouette Studio. And it's really only a good idea as a precaution in case your custom material cut settings are ever lost in an update or an upgrade or you move computers. To export a custom material cut setting open your Silhouette Studio software and navigate to the Send panel. Click the three dots (...) to the right of suggested material settings to open the Advanced Material Panel. Scroll down the list of materials until you get to the User Defined materials at the bottom of the list. This is where you'll find all of your custom material settings. You can only export one at a time, so select one and right click. 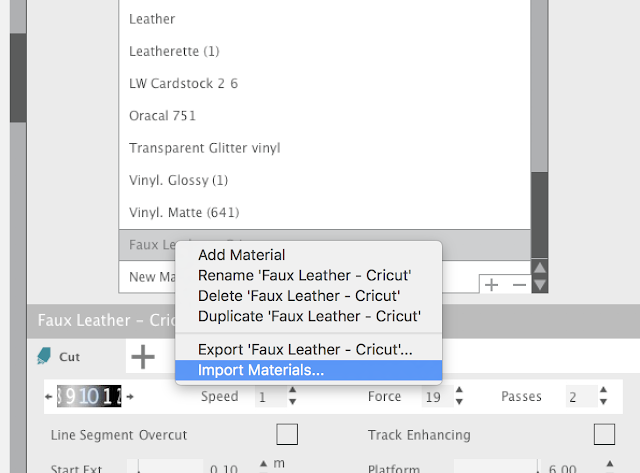 From the right click menu select "Export [Name of custom material]. In this case I am going to export the cut settings for Faux Leather - Cricut. A pop up box will appear. 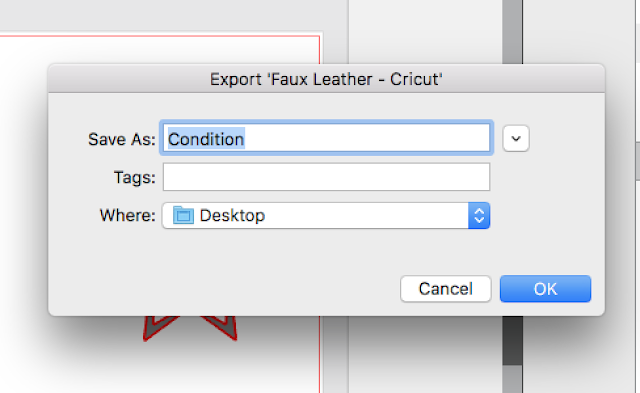 By default the cut settings will be named Condition. 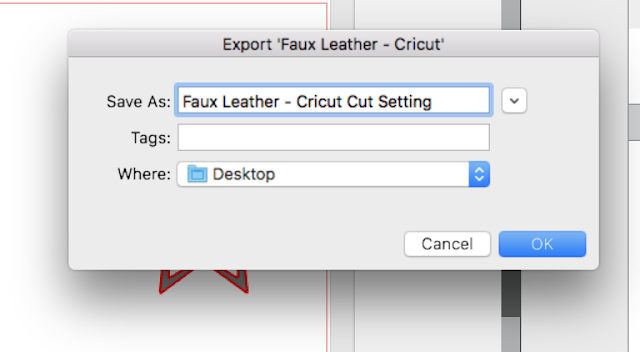 You can leave it as such or (and I would suggest) you can change the name of the file to match the name of the cut setting. Note where the file will be saved. In this case it will be saved to my desktop. When you click "Okay" the box will disappear and the file will be created and saved to wherever you told it to save. The saved file is a simple table that includes the material name, force, speed, and blade depth. It's important to know that a blade depth of "1" indicates "10". A blade depth of anything under 10 would be displayed as 0.2 (for blade depth 2). Therefore a blade depth of .1 would show as "0.1" in the spreadsheet. 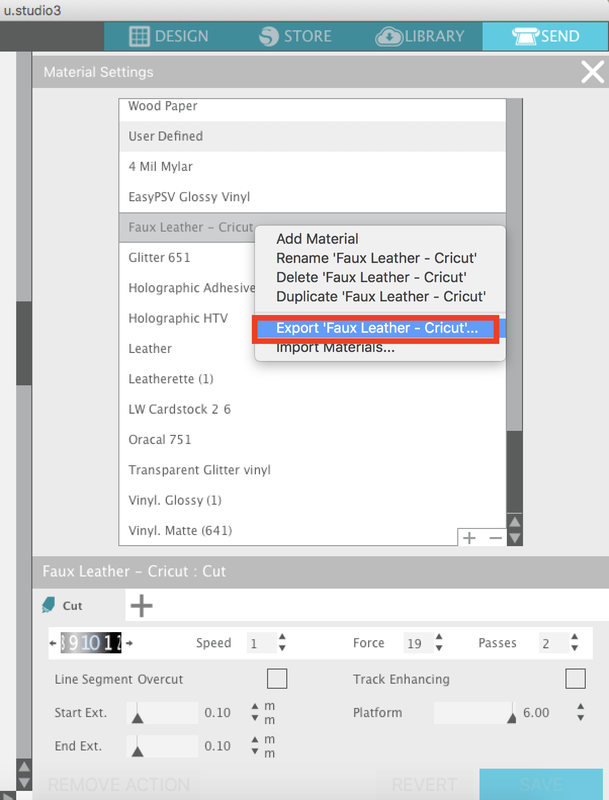 Get in the habit of quickly exporting all new custom cut settings that you create just in case! If you ever need to re-import your cut settings you'll have them and all you'll need to do is return to the Advanced Material Panel right click on any of your custom cut settings and select "Import Materials" then navigate to the file on your computer and it will re-import the missing cut setting.